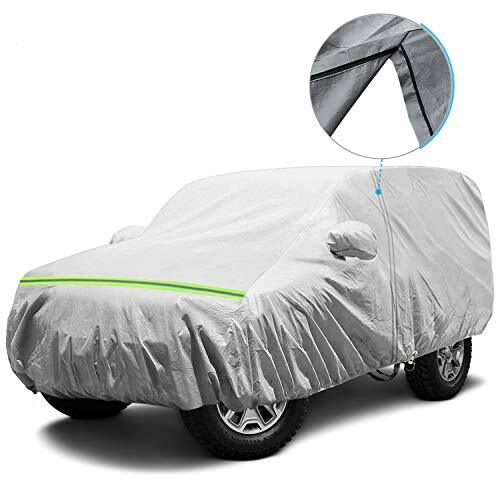 Waterproof Jeep Cover, 5 Layers 4 Door All Weather UV Protection Car Cover for Jeep Wrangler with Driver Door Zipper, Fits up to 194″ Specification: 1.The side zipper of the main driving makes you enter the car conveniently without removing the car cover. 2.MATERIAL: Made of heavy duty 5 layers fabric, superior double stitching seam workmanship. 1.The side zipper of the main driving makes you enter the car conveniently without removing the car cover. 2.MATERIAL: Made of heavy duty 5 layers fabric, superior double stitching seam workmanship. Effectively prevents your car form dust, rain, snow, heat, bird droppings, fallen leaves, harmful UV rays and scratch resistant. Perfect for all season, indoor and outdoor use. 3.The soft cotton lining protects your vehicle finish, does not scratch your paint. 4.The long anti-hit reflective stripes at the front and rear of the car can better to protect your car at night. 5.Easy and Quick to Install：Hang the installation rope on the back license plate, you can install it fastly by yourself. 6.WINDPROOF DESIGN: Wind gust strap with buckle and elastic hem at the bottom tight around the base of your car to protect your car cover from blowing off, even in heavy wind. 7.Free Anti-Theft Lock, Windproof Buckle, Antenna Patch and Storage Bag included. Please check the correct dimension according to the length of your jeep. 4 DOOR JEEP COVER DIMENSION(L*W*H): 194″x63″x57.5″inch –Please choose the correct cover according to the size of your jeep. Fit 4 Drs Jeep Wrangler CJ ,YJ, TJ & JK.Fits up to 194 inch. DRIVER DOOR ZIPPER–Driver Door Zipper for easy access, gasket at the top&bottom of zipper, to prevent scratching your car body. 100% WATERPROOF MATERIAL– Extra-Thick 5-Ply Top Fabric & 4-Ply Side Non-Woven. Is 100% waterproof and breathable, will dry quickly. WINDPROOF STRAPS&BUCKLE– Straps at Front & Rear to protect your truck cover from blowing off by heavy wind. 2 PCS REFLECTIVE STRIPES– There are 2 pcs reflective stripes in front and rear, will light in night, to warn people or other cars, avoid rubbing to your jeep.